Cheesecake, chocolate ganache and graham cracker crumbs are the start of a pretty terrific dessert. 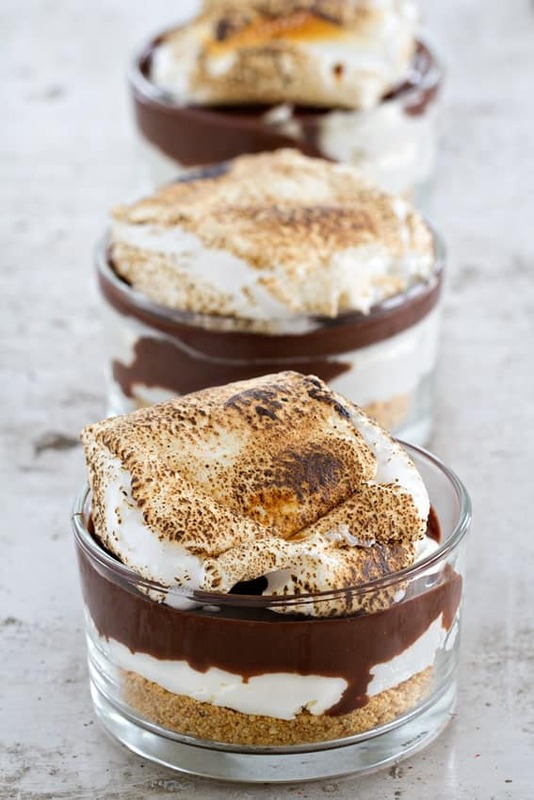 Top this no-bake dessert with a gooey roasted marshmallow to create summer dessert perfection. The weather is all kinds of crazy here in Ohio. One day we’re basking in sunny blue skies and warm temperatures, and the next day it’s raining and barely reaches 50°F. Last week we had our heat and air conditioning on within a matter of 48 hours. And our sweet baby girl, who loves every single thing about being outside, doesn’t quite understand that gray skies and frost warnings are no combination for a morning bike ride. Of course, Memorial Day fell on one of the less than amazing days. Since the yard of our new home still looks like a construction site studded with mini ponds – complete with geese – we opted to cook out at my mom’s house instead. Although the weather was pretty warm, it was windy enough to blow just about everything off the picnic table. Naturally, I volunteered to bring dessert and since I knew there’d be quite a discerning crowd gathering for dinner, I opted for something a little fancier than cookies and brownies. By fancy, I mean pretty, because rest assured, these No Bake S’mores Cheesecakes are by no means difficult. I mean come on, you don’t even have to turn on your oven! I don’t know about you, but as soon as I experience even one sunny day warm enough to make me need air conditioning on full blast, I’m ready for s’mores. S’mores ALLTHETHINGS as far as I’m concerned. And these mini no bake cheesecakes are no exception. I just loooooove that gorgeous toasted Campfire® Giant Roaster marshmallow on top, don’t you? You can make this dessert for any barbecue or summer potluck you may be attending, or save it for something special like 4th of July. The choice is yours, just make sure you get them on the table. Because they’re pretty spectacular, if I do say so myself. As you may remember from my Homemade Marshmallow Frosting, I’m partnering with Emily from Jelly Toast and Campfire® Marshmallows. You’ll see more recipes from us, and even more exciting stuff as the year goes on. We even created a Marshmallow Madness Pin Board where we’ll pinning loads of delicious marshmallow recipes from our favorite food sites. For more information about Campfire® Marshmallows, find them on them on Facebook and Twitter. 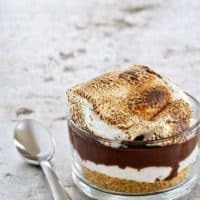 If you love marshmallow-y things as much as I do, be sure to check out my Strawberry Marshmallow Fudge and these decadent S’mores Trifles. In a medium bowl, stir together the graham cracker crumbs, sugar and melted butter. Evenly divide the crumbs between 6 individual serving dishes and press into the bottoms of the dishes to form a crust layer. Place serving dishes into the refrigerator while you prepare the cheesecake. Place 25 Campfire® Regular Marshmallows in a large, deep microwave-safe bowl. Microwave on high power for 45-60 seconds. Marshmallows will puff up and begin to melt. Use a buttered spatula to stir the marshmallows until smooth. Set aside. In a large bowl with an electric mixer, whip the cream cheese for about 2 minutes. Add in confectioners' sugar and vanilla and beat for an additional minute. Use a buttered spatula to scoop the melted marshmallows into the cream cheese mixture and beat for an additional minute. Use a rubber spatula to fold in whipped topping. Spoon or pipe the cheesecake filling directly onto the graham cracker crusts and place them back into the refrigerator while you prepare the ganache. Add chocolate to a heat-safe bowl. Bring cream just to a boil over medium-high heat. Pour heated cream over the chocolate and Let stand for 5 minutes and then whisk to combine. Spoon chocolate ganache onto the cheesecake layer and place back into the refrigerator until you are ready to serve. Just before serving, top each cheesecake with a toasted Campfire® Giant Roaster marshmallow. Enjoy! No Bake S'mores Cheesecakes will store in the refrigerator for up to 3 days. Thanks so much, I hope you get the chance to try these. I appreciate you stopping by. looks great and seems pretty easy. however, how do you get the top marshmellow toasted without using an oven?? I used a kitchen torch, but you can roast them however you want. Under a broiler, over a campfire, etc. I hope this helps. How do you roast the marshmallows on top? Oh my gosh the top of that is gorgeous! 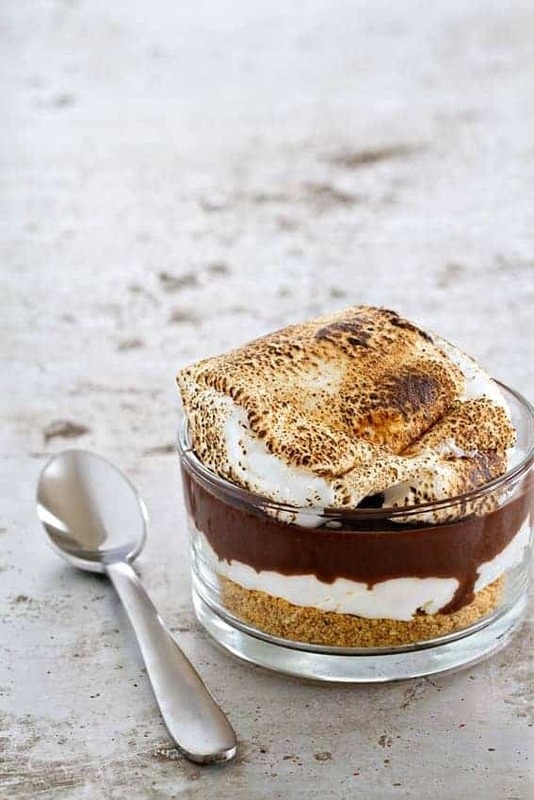 You can tell summertime is around the corner when the s’mores recipes starting coming out! :) This individual cheesecake twist on the classic s’more is mouthwatering! These look amazing!! I must try these. Where did you get the glass dishes that they are served in? The dishes are from Crate and Barrel. Thanks for stopping by! jamie, this recipe was a hit! I actually made it in a small pan vs the individual dishes due to limited supplies while camping, but it turned out GREAT!! The roasted marshmallow topper was the best part. Everyone loved this for dessert. Thanks for the great recipe!! Did I miss the step for the whipped topping? I’d really like to make your dessert, but since I live in Germany, I absolutely have no idea what this whip-thingie is I’d need for the cheesecake. I read somewhere that it’s like a cream-substitute. Is that right? You could attempt to use freshly whipped cream, although the final product will not be as stable. I’d recommend serving it immediately. Let me know if you give it a try and how it works out for you. What if we wanted to make this on a bigger scale, as in a 9″x13″ baking dish? The filling should accommodate an 8 or 9 inch crust. To make cheesecake even larger, you’d have to tweak the recipe proportions, but I think it would just fine. Thanks so much for stopping by! We built a fire pit in our back yard last January and use it all the time. Even in the summer months. 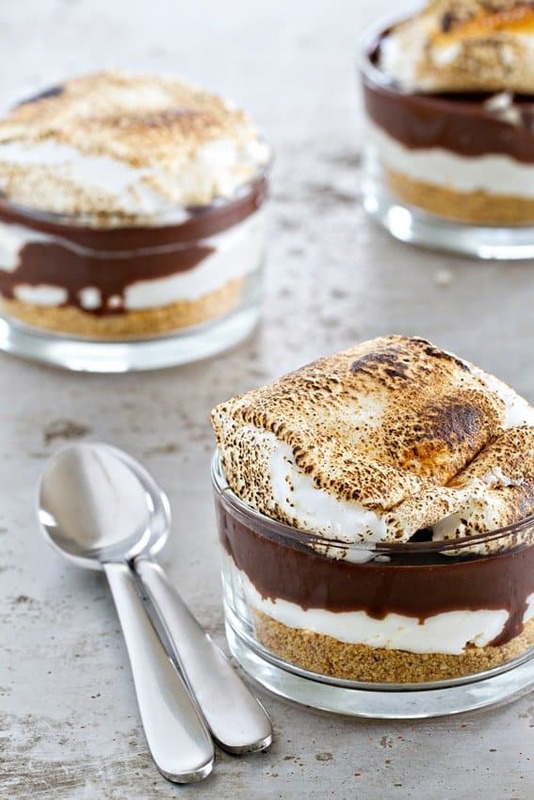 Because S’mores all the things! Yeeeesssss. These are way more epic, though. And I want one. STAT. Yes! S’mores all the things! I hope you give these a try and love them as much as we do! Everything is better with Oreos, right? Thanks for stopping by, Kita! Cheesecake AND S’mores in ONE?! All I have to say is, gimme s’more of that! But, really, these are so fun! Pinned! What a perfect dessert for summer entertaining!! Did you pop them in the oven on broil to toast the marshmallows? If I wanted to bake this in one pan, instead of doing individual sizes, would it be solid enough to serve as a cake or will it have more of a pudding consistency? Thanks! It’s definitely a softer consistency. I think you could definitely make it into a larger cheesecake, but it won’t cut super clean. I hope this helps. If you are toasting the marshmallow under a broiler, is the marshmallow toasted separately, or after its put on the dessert? I would toast the marshmallow separately. If you have a kitchen torch, I think that is the easiest and safest way to toast the marshmallow. Thanks so much for stopping by. What size are the individual serving dishes? My dishes are 3.5″ dia. x 2″H, I hope this helps! Thank you for supplying the dish size. Can’t wait to try this recipe. I don’t have a microwave. Can you suggest another alternative? Should I just melt on the stove? Hi, Jill! You can melt the marshmallows on the stove. I hope you enjoy it! I’m glad it all worked out, Serena! And I’m glad you enjoyed them! hi jamie, can i use cupcake holder intead of jars?thanks, i really want to try this recipe..
Hi, Salie! I think cupcake holders might be a bit flimsy for the cheesecakes. Do you have smallish drinking glasses? I’ve been able to find things like this at IKEA or the Dollar Store. You may be able to put the cheesecake in there for the same results. Let me know how it goes! Hi curious to know if you could give nutrition information on theses as I have a diabetic child and would like to make sure we cover for his carbohydrate intake. Hi, Brandy! You can use this Nutrition Calculator to see what the information is. I hope you enjoy the S’mores Cheesecake! Have you tried this recipe using homemade marshmallows? I’d like to try but I worry about how they might “toast”. Thank you! !